Status: A membership organisation managed by a committee elected from its members at the annual general meeting. Abergavenny Borough Band has been in existence for over 100 years. It is a small local charity based in Abergavenny, Monmouthshire and provides musical entertainment to the public, organisations and for civic occasions. The Band prides itself on its commitment to education and has a junior section where young people under the age of 18yrs can be given tuition in the techniques of playing a brass instrument and be taught to read music. The senior band (from age 11yrs) has a long tradition of contesting which raises the standard of playing both for the band as a whole and for individual players. The band is well established in the top divisions of Welsh brass bands, having first achieved Championship status in 1982. The band has been National Eisteddfod and Welsh League Champions on numerous occasions since, most recently in 2011/12 under the baton of past Musical Director, Craig Roberts. In recent years the Band has performed at a wealth of prestigious venues including St David's Hall, BBC Hoddinott Hall, the National Museum of Wales, the Royal Welsh College of Music & Drama, Wales Millennium Centre and Royal Albert Hall. In September 2012, Abergavenny performed in the closing event of the London 2012 Olympic Park, leading the nationwide Cultural Olympiad "Bandstand Marathon" of 180 000 performers from there. One week later the band then performed for the nationally televised and broadcast Homecoming event for Welsh Olympic & Paralympic athletes at the Senedd, Cardiff Bay. The Band played to its largest live audience of more than 58 000 people, plus national television audience, at the Millennium Stadium, Cardiff, performing there together with the massed WRU male choir. Abergavenny has toured to Spain and Germany, undertaken two professional commercial recordings, and broadcasts for both BBC Radio 3 and BBC Radio Cymru. The band has worked with a range of leading professional conductors & soloists including Dr Robert Childs, David Childs, Philip Harper, Dr Hayden James, Dr Alwyn Humphreys and West End stars Peter Karrie, Sarah Lark and Katy Treharne. Abergavenny has also worked with the UK's favourite classical composer Dr Paul Mealor, who directed Abergavenny in the world premiere performance of his "Jubilate! Jubilee! ", written to commemorate the Diamond Jubilee of Her Majesty Queen Elizabeth II in 2012. 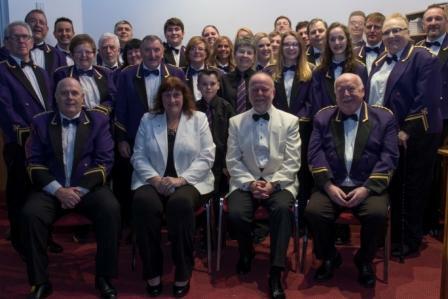 In addition to all of the above, Abergavenny Borough Band prides itself on the band's continued commitment to its local community, performing regularly for a range of civic functions and public concerts, as well as continuing to offer educational opportunities for young musicians and adult learners through the Abergavenny Youth Band. In 2015 the Band was proud to lead the National Eisteddfod Proclamation Procession to the Ceremony in Caldicot Castle to announce the holding of the event in Abergavenny in 2016. March 2017 saw the Band win the Welsh Regional Championships (section 2) in Swansea, thus qualifying for the National Finals in Cheltenham in September.